This is one of the more original fantasy stories I’ve read in a long time, with a mixture of high fantasy, mythology, and religious beliefs. There is an ostracized peasant boy, Lonan, who lives in a village plagued by monsters in the night; but he dreams of the hardships of a prince, Adahy, son of the Magpie King who must learn to follow in his father’s footsteps as a hunter of the monsters. Woven between the main story are folk tales and myths which provide hints to the secrets behind the story. It’s all deftly written and captivating with vivid characters. The mythology in particular is interesting because it’s a combination of European and Native American influences into something totally new. At first it seems like these folk tales are just world building or a distraction from the main story, but they actually provide important clues and become more closely involved with the plot as time goes on. All is not what it seems in this story and the twists surprised me in several places. Yet the ending feels inevitable when it comes. I almost wanted to look away from what was happening but I had to keep reading until the last page, hoping against hope that things would turn out better. One character, the Pale Lady, had the hairs standing up on the back of my neck. 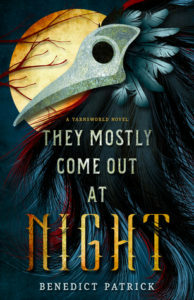 This book is a prime example of dark fantasy, not in the newer sense of “grim dark” that dwells on explicit violence and gore, but in the classic sense that straddles the line between fantasy and horror. There’s an oppressive tension throughout the book, a fear of what could be out there in the dark, horrors brought on by both monsters and men. It starts with the promise of the beautiful cover and the ominous title, and doesn’t fail to deliver from there, right up through the bittersweet ending. It’s sad but fitting to the rest of the story. It’s part of a series, but it’s a complete story arc on its own. A peek at the second book in the back hints that it will be a new location with different characters, so I think they’re intended to be stand-alones in a shared world. Either way, I’m eagerly looking forward to the next book. This is an amazing debut from the author and I want to see more of his writing. I’d recommend this book to fans of Tanith Lee, Charles de Lint, and Terri Windling. If you like dark fantasy with a new take on fairy tales and folklore, you should definitely check this out.